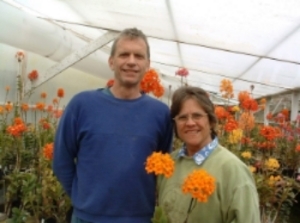 About Us — Cal-Orchid Inc.
Cal-Orchid is a wholesale/retail nursery in Santa Barbara, California. It offers a wide variety of orchid plants including Cattleyas, Cymbidiums, Epidendrums, Angraecoids, Lycastes, Sobralias, Laelia naceps and it's hybrids, as well as species and miscellaneous hybrids. Visitors are welcome. and affords visitors an opportunity to find unique plants not available in the general marketplace, whether for the collector, beginner, gift-giver. The owners travel extensively to hunt for new plants, and have robust breeding program, having submitted to various laboratories over 4500 seed pods and 500 cultivars for cloning. A trip to Cal-Orchid presents the orchid shopper with plants suitable for growing indoors, outside in garden settings (or on trees), or in the greenhouse. There is an extensive out door/temperature tolerant selection comprised of not only cymbidiums, but Laelias and their hybrids, and many other genera. For those in temperate zones, their ‘Pacific’ line of reedstem Epidendrums has garnered them the designation as The EpiCenter! Their breeding in this group has resulted in TV exposure, and many articles published all over the world.